The "Change Begins Within" Press Conference at Radio City, NYC on April 3, 2009, with John Hagelin Ph.D, David Lynch, Russell Simmons, Paul McCartney, Ringo Starr, Donovan, Paul Horn, Mike Love and Moby. Also performing at the concert on April 4 was Sheryl Crowe, Eddie Vedder, Jim James, Bettye LaVette, and Ben Harper, for the benefit of the David Lynch Foundation to teach 1 million at risk kids Transcendental Meditation. John Hagelin: " Over the past couple of years the foundation has taught over 100,000 children to meditate in 30 countries in North and South America, in Europe, in Africa, in Asia and the Middle East." David Lynch: "If we can get this to 1 million kids it'll be huge!" Russell Simmons: "I'm a meditator, my children are meditators. It's changed their life and I want to give this gift that I've given my children to all kids." Paul McCartney: "It is, it's a life long gift, you know it is something that you can call on at any time. Now it's actually come into the main stream we (Ringo Starr and I) think it's a great thing and so thank you David for putting it together." Donovan: "The proof is in, Transcendental Meditation naturally unfolds any student's full potential, now there are thousands of students who are already receiving it and they are raising their self esteem, they're improving their well being." Paul Horn: "These kids that are 11 and 12 and 13 from the inner cities that are experiencing quiet and expressing that they are less angry and are getting much more out of life is proof in the pudding." Mike Love: "The David Lynch Foundation's goal of teaching 1 million children Transcendental Meditation - that will be like a million steps in the direction of world peace." Moby: "It's not ideologically driven, it's not dogmatic it's a simple practice that calms the mind"... "One of the things that impressed me so much about Transcendental Meditation (TM) when I finally learned it was it's simplicity. No other meditation technique no other practice I tried was as effective of quieting my mind and helping me go to a calm and centered place." A brief overview of the pre-concert press conference at Radio City Music hall on April 3, 2009. The Online TV Channel that celebrates consciousness, creativity and bliss. DLF.TV showcases videos from David Lynch Foundation events, compelling documentary profiles, exclusive content from David Lynch, and all aspects of creativity. NYTimes.com - Music Review - David Lynch Foundation - Paul McCartney, Ringo Starr and Friends Support David Lynch Foundation. The two surviving Beatles shared a microphone, and then embraces, in their first public performance together since a 2002 memorial concert for George Harrison. 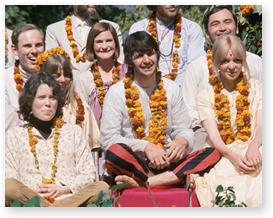 the Guardian : "The Maharishi said he wants us all to be cosmically conscious." He smiled his Macca smile. "It's such a joy."